Humanity, it seems, has a lot to learn. At the 2018 World Government Summit in Dubai, Tyson gave a presentation to an enraptured audience. The topic? How humans will — most definitely not — colonize Mars (Tyson, if you aren’t aware, is an eternal skeptic). It seems fitting then that, following his rather depressing speech, he took the time to discuss how humans are, in many ways, entirely ignorant. A portion of our universe is missing. A rather significant portion, in fact. Scientists estimate that less than 5% of our universe is made up of ordinary matter (protons, neutrons, electrons, and all the things that make our bodies, our planet, and everything we’ve ever seen or touched). The rest of the matter in our universe? Well, we have no idea what it is. 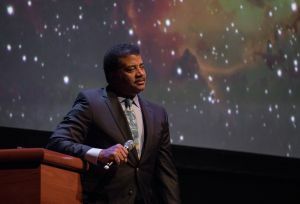 “Dark matter is the longest standing unsolved problem in modern astrophysics,” Tyson said. He continued with a slightly exasperated sigh, “It has been with us for eighty years, and it’s high time we had a solution.” Yet, we aren’t exactly close. The problem stems from the fact that dark matter doesn’t interact with electromagnetic radiation (aka light). We can only observe it because of its gravitational influence — say, by a galaxy spinning slower or faster than it should. However, there are a number of ongoing experiments that seek to detect dark matter, such as SNOLAB and ADMX, so answers may be on the horizon. Dark energy is, perhaps, one of the most interesting scientific discoveries ever made. This is because it may hold the keys to the ultimate fate of our universe. Tyson explains it as “a pressure in the vacuum of space forcing the acceleration of the [expansion of] the universe.” Does that sound confusing? That’s probably because it is. If you weren’t aware, all of space is expanding — the space between the galaxies, the space between the Earth and the Sun, the space between your eyes and your computer screen. Of course, this expansion is minimal. It’s so minimal that we don’t even notice it when we look at our local solar system. But on a cosmic scale, its impact is profound. Because space is so vast, billions of light-years of space are expanding, causing many galaxies to fly away from us at unimaginable speeds. And if this flight continues, eventually the cosmos will be nothing more than a cold unendingly dark void. If it reverses, the universe will collapse in on itself in a Big Crunch. We know a lot about how life evolved on Earth. About 3.5 billion years ago, the earliest forms of life emerged. These single-celled creatures dominated our planet for billions and billions of years. A little over 600 million years ago, the first multicellular organisms took up residence. The Cambrian explosion followed soon after and *boom* the fossil record was born. Just 500 million years ago, plants started taking to land. Animals soon followed, and here we are today. However, Tyson is quick to point out that we don’t understand the most vital component of evolution — the beginning. “We still don’t know how we go from organic molecules to self-replicating life,” Tyson said, and he noted how unfortunate this is because “that is basically the origin of life as we know it.” The process is called abiogenesis. In non-scientific jargon, it deals with how life arises from nonliving matter. Although we have a number of hypotheses related to this process, we don’t have a comprehensive understanding or any evidence to support one.